For people looking to step into an established, profitable franchise, one of Home Instead Senior Care’s four territory resales represents a perfect opportunity to make money and make a difference to society at the same time. For some entrepreneurs, taking over an established business is more desirable than a start-up. A resale is the ideal proposition for people who want to become part of our mission ‘to change the face of ageing’ but with an established team, office and structure in place. It’s also the right match for entrepreneurs who can see the market potential of an ageing population and quality care provision for seniors longer-term, as homecare continues to become the care model of choice. An experienced office team in situ. An established client base of seniors in a territory with a geographical area covering a minimum of 25,000 people over the age of 65. A fully trained team of CAREGivers to service a growing client base. The Home Instead Senior Care franchise has proven longevity, we have been operating in the UK for the last 12 years and are proud to have recruited over 190 franchises to date. Many of our franchises are turning over in excess of £1 million per year with operating profits of 15-20%. Read on to see how a Home Instead franchisee in Weston-Super-Mare returned to his caring roots to take a territory resale to a £1m turnover. 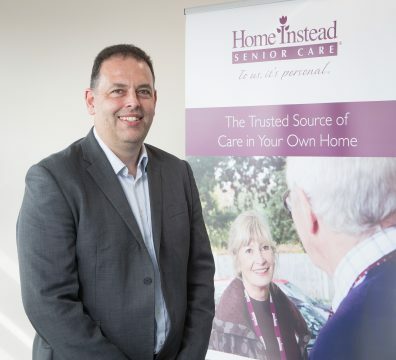 But after meeting a current franchisee looking to realise their investment and sell their territory, Mike realised that the Home Instead Senior Care model, alongside the support and training offered, was everything he was looking for. Mike, 46, said: “I’ve worked my way up through the career ranks, and my wife and I have had experience of a start-up, but I’ve never had the chance to take a business to its next level. Mike admits that he was also looking for something more than just a successful business, “I wanted to do something that felt worthwhile and to use my experience to help an organisation that was about more than just profit. I’d been looking at getting involved with a charity or third sector organisation but couldn’t find a way to make it work. Mike’s career started in High Wycombe, when he joined materials testing company, Instron, as Technical Support. Over 20 years, he worked his way up through sales and general management, before becoming European Sales Manager. After time at Macfarlene Packaging and then launching a cost management services company with his wife, Mike decided he wanted his next move to be the purchase of an already successful company. He said: “I’d actually already found a business opportunity. It was a much bigger business and I was buying it with partners, but it fell through late in the process. After finding out about the opportunity in Autumn 2016, terms had been agreed by Christmas and Mike completed his purchase of the Weston-Super-Mare office on 1 April this year. 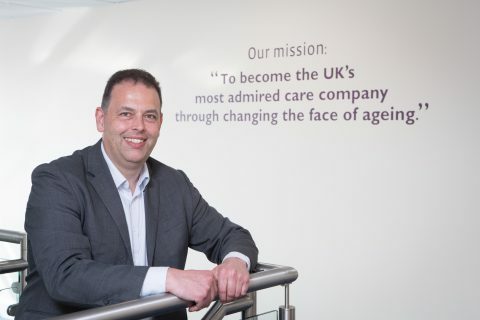 With 80 clients and 40 CAREGivers, Mike’s first priority has been getting to know his team and his clients, whilst learning about the systems, procedures and responsibilities involved in providing exemplary homecare as part of a multi-award winning homecare franchise network. As well as support in terms of care quality and standards, Mike has also found the training available from National Office across all areas invaluable in his franchise journey to date. Mike’s clear on what his business ambitions are and he’s looking to double turnover over the next five years, taking it from £500,000 to £1million. He has already seen that demand is outstripping resource and has spent the last few weeks out in his community meeting people with the aim of recruiting more CAREGivers to deliver Home Instead’s quality care and companionship. Commenting on the business opportunity the senior homecare market presents, Mike said: “There aren’t many businesses you can go to where there are more clients than you can deal with. I want to spend the Summer getting traction and then expect to see solid business growth by the Autumn. Home Instead Senior Care franchisees all recognised the fact that investing in a franchise in the senior care market represented a wise investment. The combination of an ageing population plus growing recognition that home based care is often the best and most cost-effective way to look after our seniors, means the demand for homecare services for older people is growing at an unprecedented rate.